There’s a lot of things that doesn’t go into the biography part of this website. A lot of small trivia, some funny, some sad. I’ve tried to collect some of each. Johnny Cash is interred at Hendersonville Memory Gardens, next to his wife, June. Several of Johns fellow musicians is also interred here: Maybelle Carter (mother-in-law), Merle Kilgore (Country singer) and at last but not least; Luther Perkins from the Tennesse two, Johnny’s guitarst. 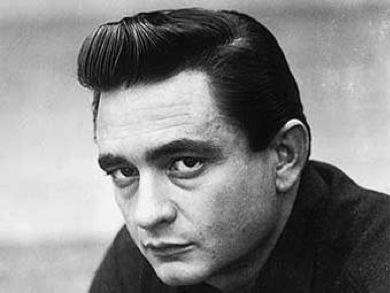 Cash was related to other country stars.His brother Tommy Cash, his own daughter Roseanne Cash, his son John Carter Cash, married to June Carter Cash, and the Carter Family was his in-laws. Only Hank Williams shares Johnny Cash’ achievement of being inducted to three hall of fames. Johnny Cash suffered from a fear of flying and snakes. The scar on his face was a result of an attempt to remove a cyst while he was serving in the air force in Germany. Johnny Cash made friends with every US President from Nixon up to Bill Clinton. He was least close to Clinton, both because of a personal distrust and his declining health. He was closest to Jimmy Carter who was a very close friend, and a distant relative to his wife. The friendships had nothing to do with politics, and he never endorsed any administration. Johnny would often make fun of his bandmates in Tennessee Two. Guitarist Luther Perkins was secretly terrified of performing in public, and would often perform with very little excitement. And when Johnny introduced him, he would say things like “he’s playing in rigor mortis”, or “he has been checked to see if he’s still alive”. Bass player Marshall Grant used to chew a lot of gum at the shows, and Johnny would introduce him as “playing the chewing gum…”. Cash stated in an interview with Larry King that his favourite country singer is Dwight Yoakam. Coldplay were supposed to record a song titled “Kingdom Come” with Johnny Cash, for their album X&Y, but Cash passed away too soon. Johnny Cash talked in swedish in between songs at his live performance in Österåker Prison in Sweden. Supposed to have proposed to June Carter for over 30 times before she finally said yes. The US Navy’s winter service uniform is reffered to by sailors as “Johnny Cashes”, as the uniform’s shirt, tie and trousers are solid black in colors. The song “Thirteen” from American Recordings were written by Glenn Danzig. Glenn Danzig is a satanist that regards himself as the son of satan. Kris Kristofferson – Why Me Lord?